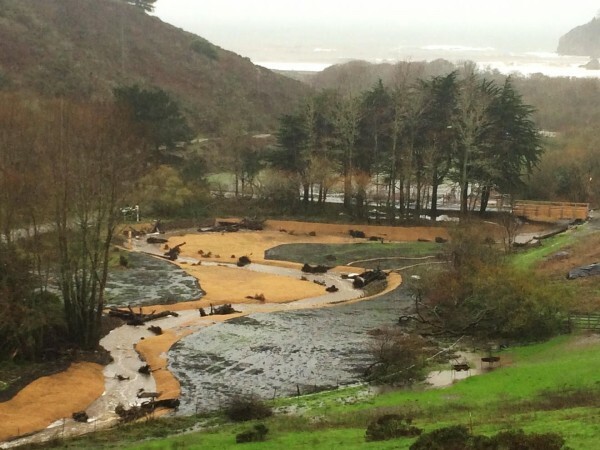 Green Gulch Enhancement Project | Prunuske Chatham, Inc.
Green Gulch Creek is a tributary to Redwood Creek in Marin County, one of the last streams south of Lagunitas Creek with a remaining wild run of coho salmon. The San Francisco Zen Center operates a meditation center and one of California’s oldest continuously certified organic farms on the property. Historic realignment and hardening of the channel have resulted in significant degradation of instream and riparian habitat. PCI prepared a restoration design for 2,400 linear feet of channel and assisted with environmental compliance and securing grant funding. Phase 1, recreation of a natural meandering channel at the downstream end, was constructed in 2014. Phase 2, reconnection of a tributary to restore sediment delivery and assist with summer streamflows, was completed in 2015. The primary focus of the project is to provide summer rearing and winter refuge habitat for salmonids hatched in Green Gulch Creek as well as those rearing in the estuary area. Completed work includes construction of 700 linear feet of new, meandering channel with inset floodplains; wood structures using redwood logs, root wads, and trees salvaged on site; installation of an HS20 vehicle bridge; and revegetation of 1.5 acres of riparian and wetland habitat.